Metro will be the region’s transit planner, providing leadership for the transit map of the future. The region’s public transit needs are great, and the current multi-party approach has flaws that threaten the overall viability of the network. 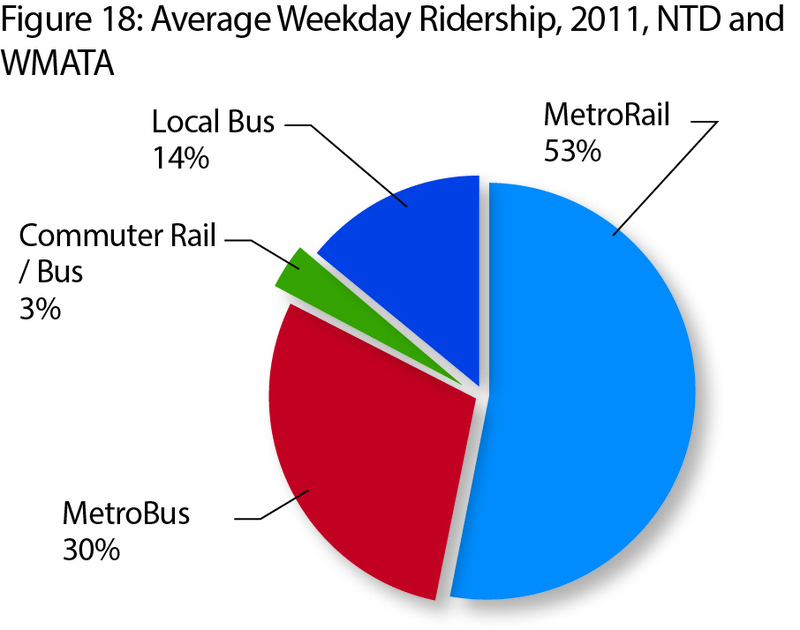 Metro is the only entity that is capable of and chartered to provide regional transit leadership. 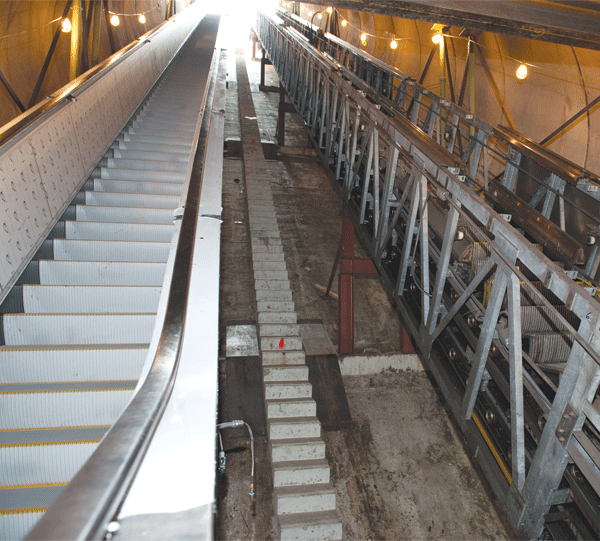 Metro has and will continue to make these and other investments, but it should be noted that jurisdictional partners will also have to do their part in order to ensure that these investments result in significant improvements. This means cooperating on mobility policies, coordinating on capital investments such as traffic signal prioritization, and making land use decisions that support transit usage and ridership gains, especially in areas where Metro has underutilized existing capacity. Metro will provide reliable, accessible, clean and customer-focused transit service. 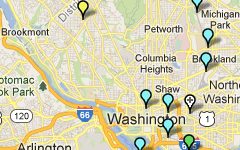 Metro strives to be the region’s preferred ride. That means that Metro will provide on-time service that gets customers where they want to go, when they want to get there. From the moment customers arrive in a station or board a bus or Access vehicle, Metro will strive to make travel safe, reliable, clean, comfortable and affordable. Trip information will be easy to hear and simple to obtain with support from the latest user-friendly technology and responsive staff. Over eighty percent of both bus and rail customers surveyed are ‘highly satisfied’ with service. 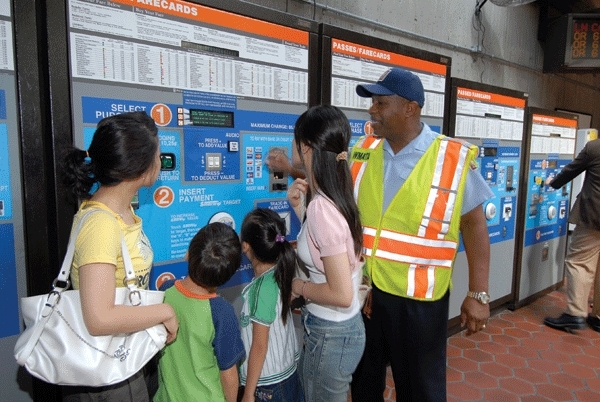 Metro will create a safer and more secure transit experience for customers and employees. Momentum requires Metro to reclaim its leadership role and to ensure that the region’s transit network meets the region’s needs. Metro’s Compact charges it with putting forth plans and mobility projects that enhance regional mobility and to be the champion for the regional rider. This means moving beyond the role of “convener” and mere “coordinator” and embracing the roles of “leader”, “collaborator”, and “co—author”. 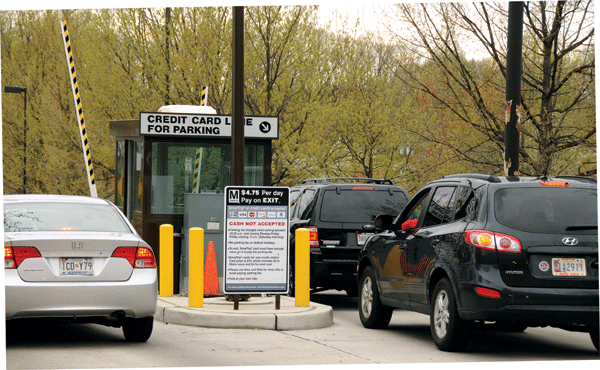 Living up to this charge means leveraging the relationships with sister agencies Metro has already built by collaborating with partners from concept to execution. Metro will bring its partners in early to co-author mobility innovations, engage in joint problem-solving, and collaborate on bringing these projects online and into operation. As the lead transit planner, Metro will literally draw the region’s transit map and advocate for its implementation. 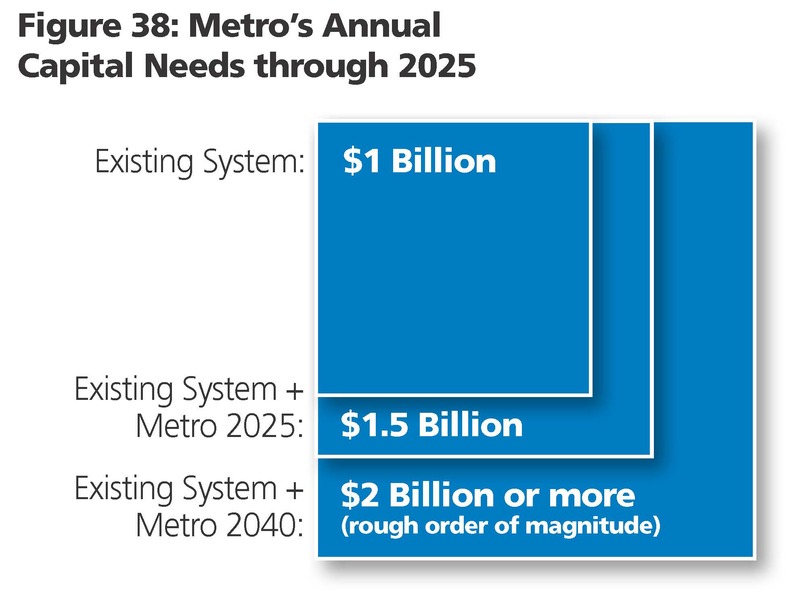 The strategic plan for Metro supports the vision of tomorrow’s transit ride and gives guidance to the types of investments and decisions that Metro can and must make in order to achieve this vision and support the region. 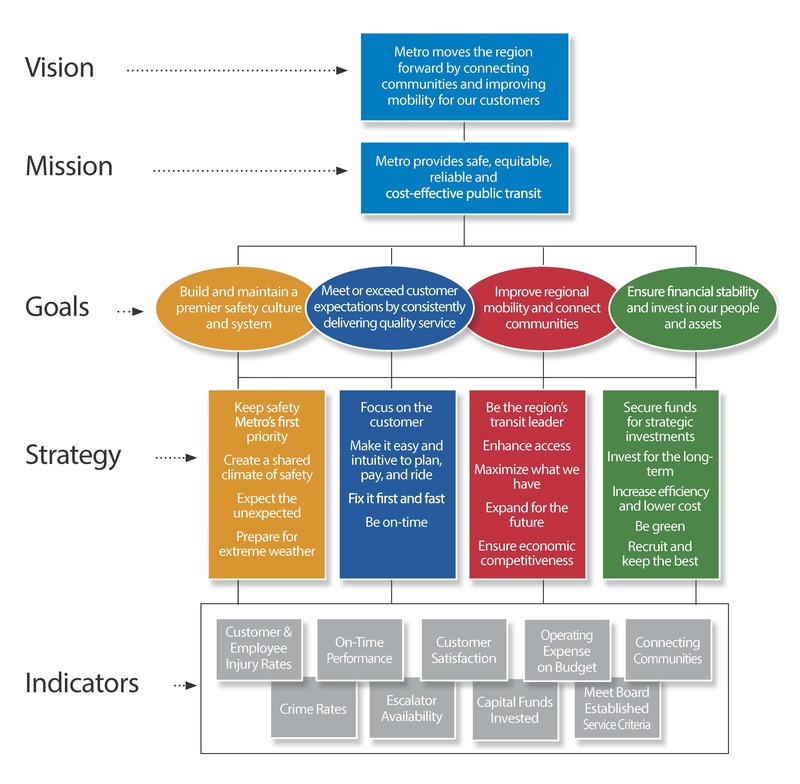 The strategies flow directly from Metro’s Board-endorsed vision, mission, and goal statements, and provide the overarching framework for executing the General Manager’s business plan.